Gold and silver closed down Friday, ending the week at $1535.50 and $27.40, respectively, leaving many to ponder the future of the metals. For those who have chosen to protect their savings with precious metals, and not just to make a quick buck, we react to these events with a bigger-picture view: Remain diversified. If you put at least some of your assets into gold and silver even just a few years ago, Friday’s losses are just a bump in the road, but a bump that warns you not to fall into a complacent rut. Spread out your savings, not just in a variety of stocks, bonds and mutual funds, but into various types of assets. Diversifying your portfolio will protect you from fluctuations that are normal for any market. But as it relates to precious metals, Friday’s move could be the type of over-exaggerated dip that’s typical of markets seeking direction from larger moves. Remember, the fundamentals for gold and silver haven’t changed one bit, plus we still have the same never-ending Quantitative Easing from the Fed, poor economic indicators for the U.S. economy and a Eurozone that is on the brink of collapse. So if you liked precious metals early last week, the chance to get in this week at a lower price means you have to love them now. The bears are growling, but you must wait this one out. Remain diversified, and if you don’t already hold gold and silver in your portfolio, you may never have a better opportunity than this. 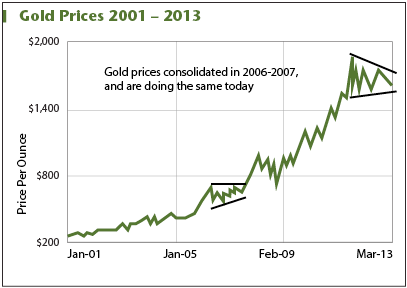 A true gold investor is in for the long haul. Paper currencies come and go, but gold is everlasting. For proof of the protection it provides, look no further than Cyprus, which is selling some of its gold to keep its economy afloat. The currency wars are starting to heat up, ironically, thanks to the yellow metal. Set your positions wisely in the market. Don’t allow your portfolio to become over specialized; stay sharp, and when the bubbles begin to burst, you can be certain that with gold and silver, you still have real value in your possession. History from 2006-07 poised to repeat itself? With money so cheap, housing looks like a good investment again in the U.S., but is it a another bubble that will burst? Will buying from China pick up on gold’s latest dip?